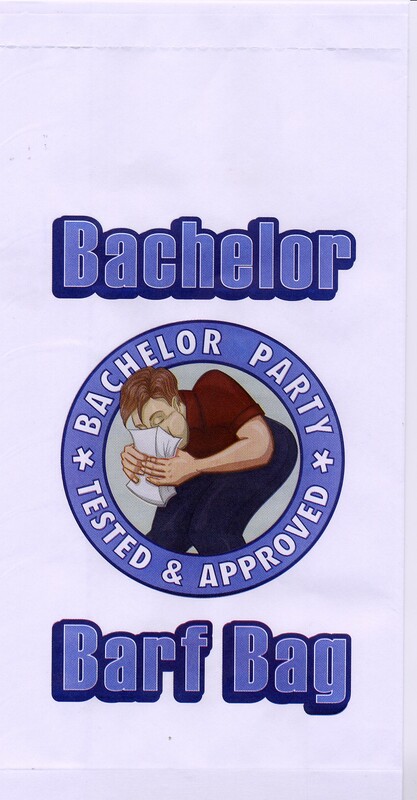 This bag is Bachelor Party Tested and Approved! I'm not sure who tested and approved it, but I'm certain they were thorough. 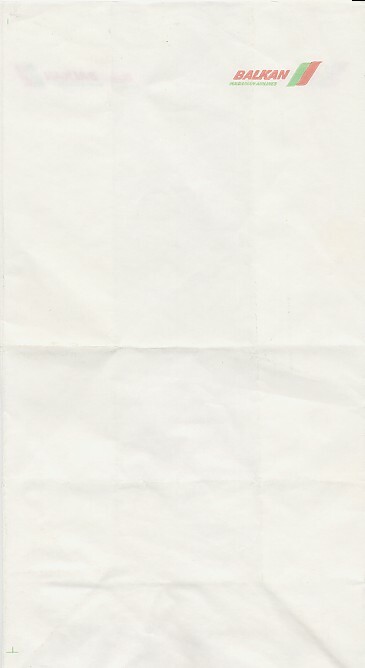 Has a picture of a guy with his face in the sack. 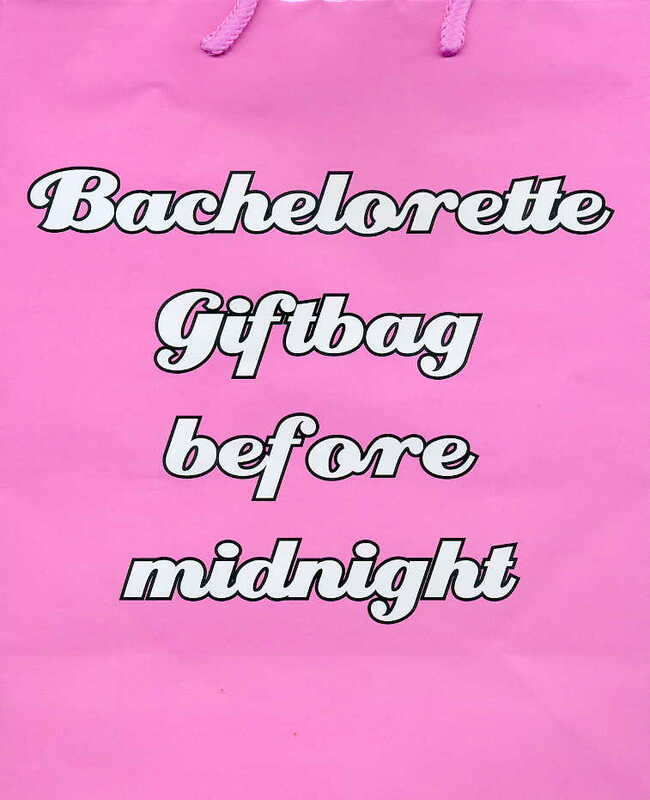 This bag is Bachelorette Party Tested and Approved! 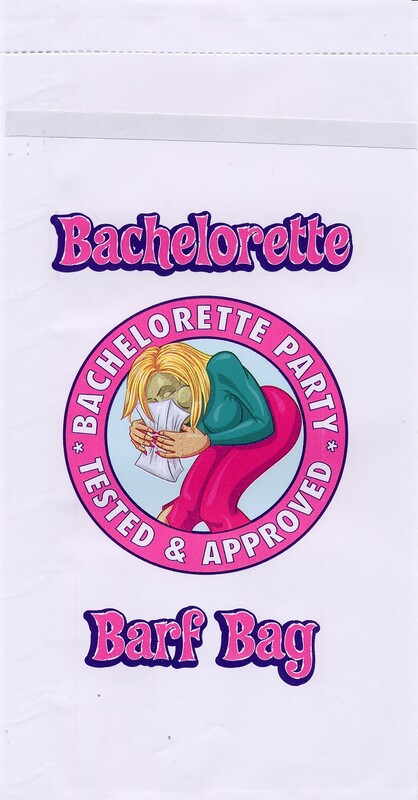 I'm not sure who tested and approved it, but I'm certain they were thorough. 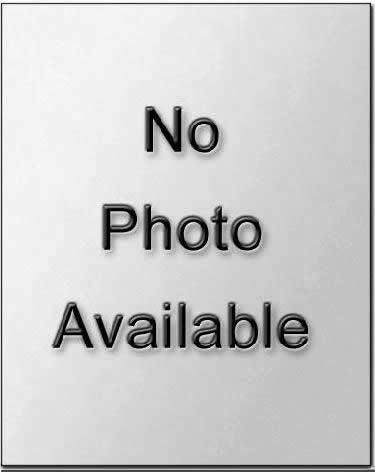 Has a picture of a green faced woman with her face in the sack. 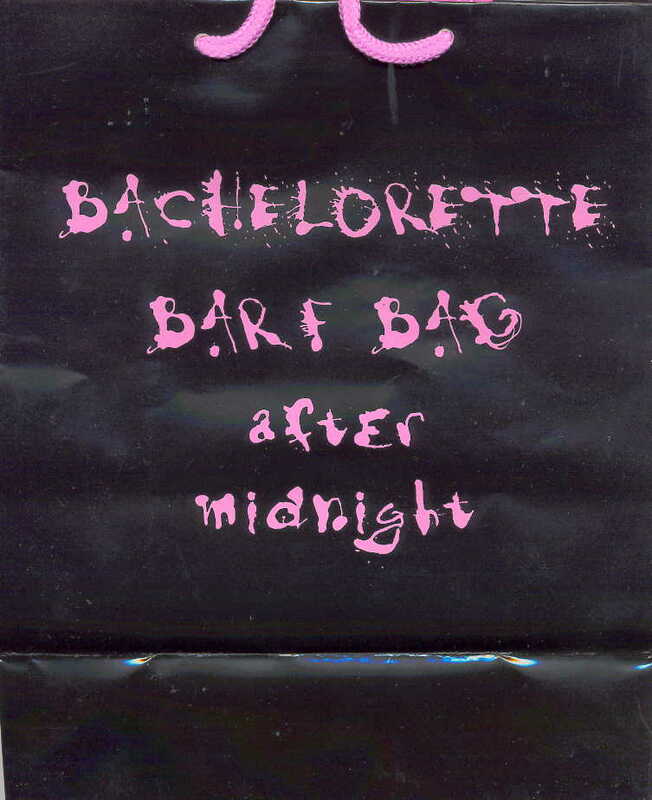 This is really more of a gift bag than a barf bag, but it says on the front, "Bachelorette Gift Bag Before Midnight" and on the back "Bachelorette Barf Bag After Midnight". So I had to have it. Wow, could they be any less specific? 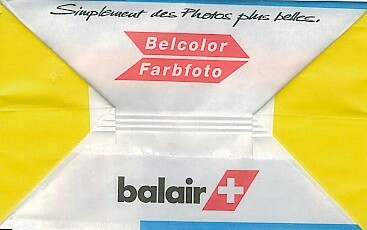 This bag reflects the pre-merger days of Balair, before joining with CTA. 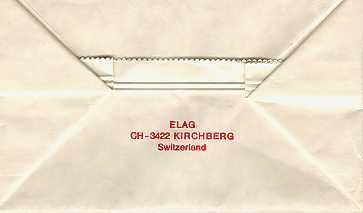 This is a Swiss bag that was actually made in Switzerland. A very slick design. 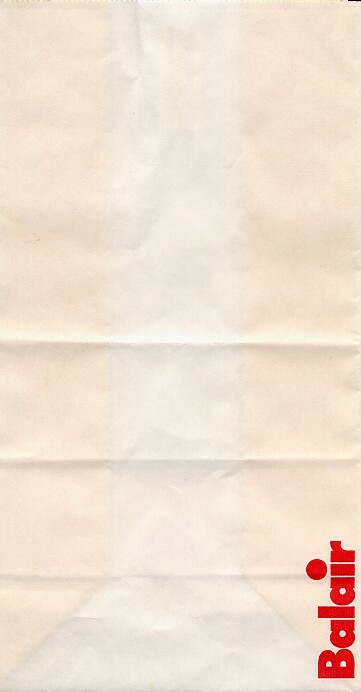 While at first glance, this seems like a very plain bag, open the folds and the bag is yellow! You can see it bleed over into the bottom portion of the bag. Talk about attention to detail. Balair has come full circle. 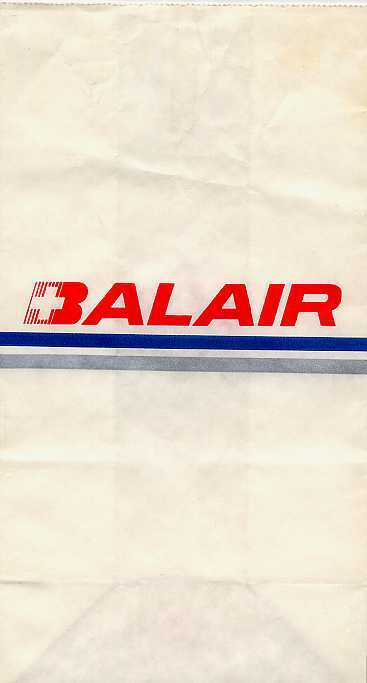 From their mid-90's merger with CTA, in which they trashed the classic Balair bag in favor of a film processing bag to their current offering with the CTA part completely excised. 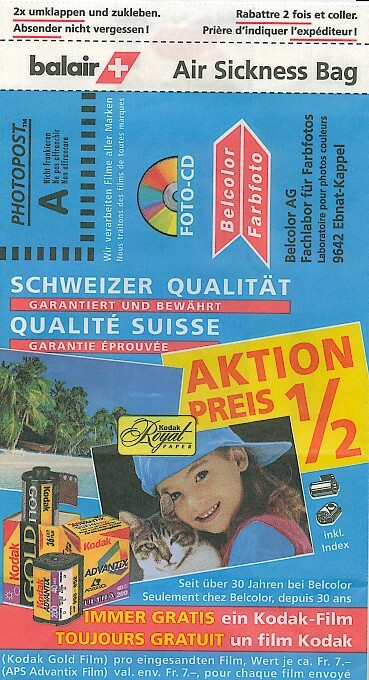 Not to mention that they now also offer a Foto-CD, in keeping with the times. 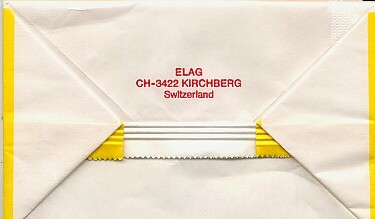 Balair and CTA merge and decide to put out a film processing bag eerily identical to Crossair. 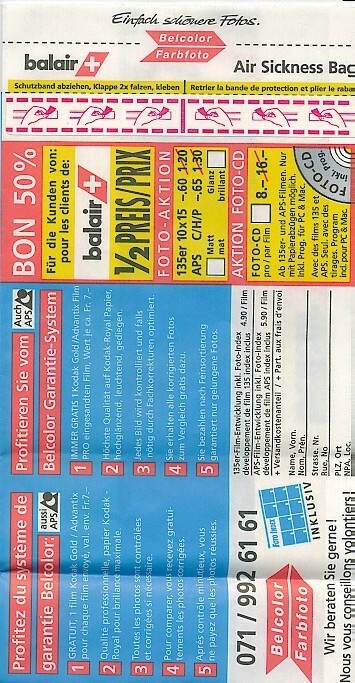 If you understand French, you'll see that Belcolor Fabfoto has been in business for 25 years. On subsequent bags, you'll see it gets upped to 27, 28, and eventually 30. 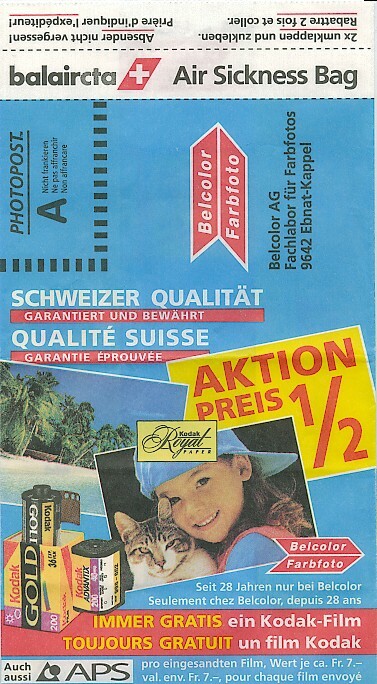 Also notice that the bag features 3 photos. 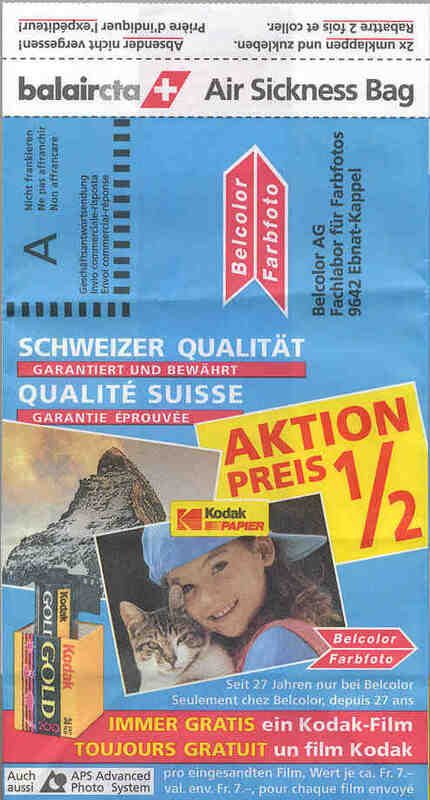 The Beach photo disappears in 1999, then in 2000 the Matterhorn photo is replaced by the beach photo. 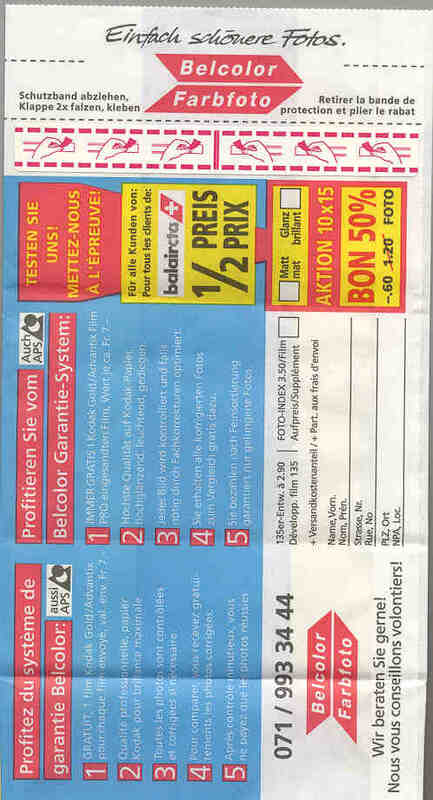 Most colorful of all the film offer type bags. 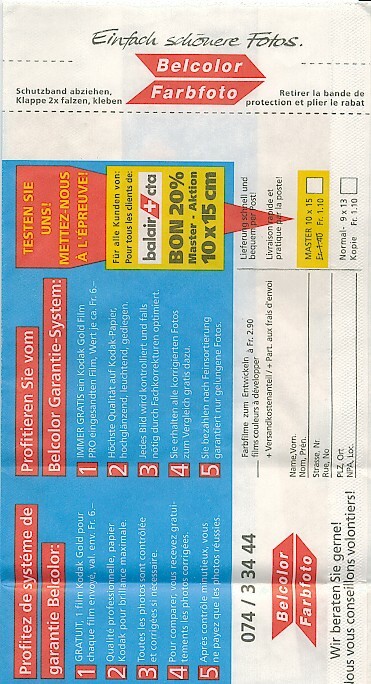 I have to hand it to the Swiss. They have the best designers. I give this bag extra points for not using English in their film offer. 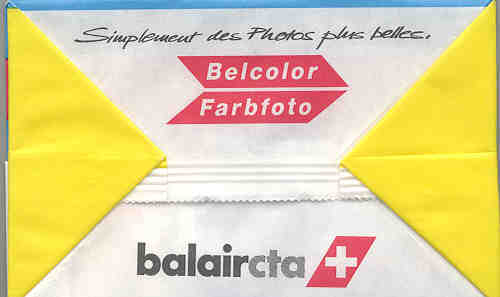 "This looks exactly like the other Balaircta photo bag", I hear you cry. 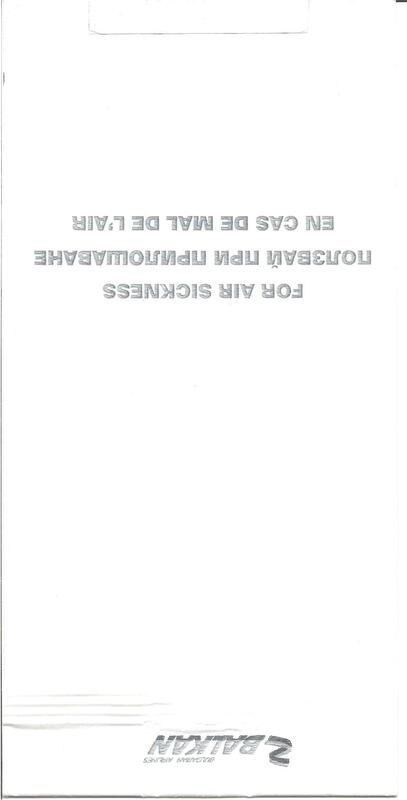 But look closer. 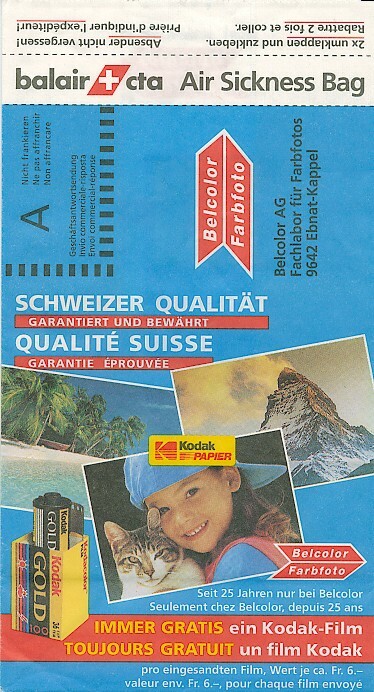 Immediately obvious is that they replaced the photo of the Matterhorn with a photo of a tropical beach. Not that BalairCTA flies to anywhere that has a beach with palms or anything. 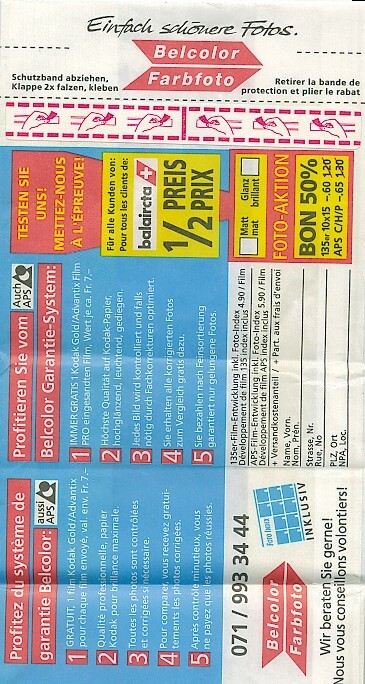 Also, Bruce Kelly notes that both Balair and Crossair have 5 film offer bags. I only seem to have 3 of the Balaircta bags at the moment. 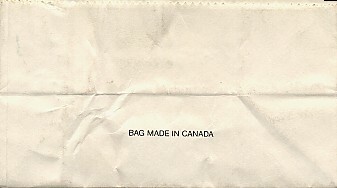 In this particular bag, the film company has been in business 28 years. Alternate bags exclaim 25 years (I only have this one in Crossair), 27 years (2 different versions -- one with APS [whatever that is], one without), and 30 years. Some day, I'll add progression information to the site. A beautiful and bold bag with an abstract bird on the front and minimal instructions on the back that don't work. See, the bag is plastic and folding it over after use as specified does nothing as anyone who has ever used plastic bags can attest to. Luckily, there's a twist tie inside. Still, nice colors! This bag SCREAMS "Soviet Bloc". Has Cyrillic writing with a flying Communist star. If you feel inside the bag, it sure doesn't seem very water resistant. 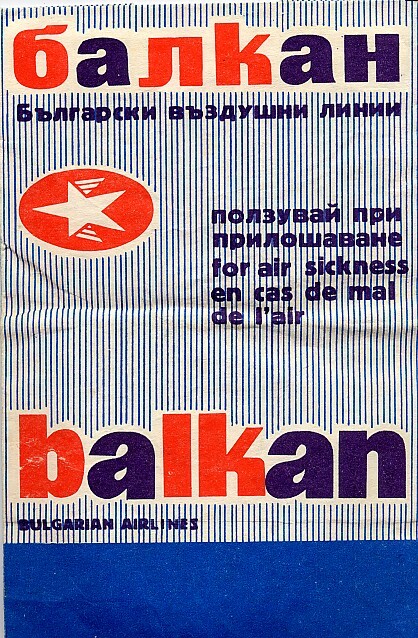 Identical to other bag except the color scheme here is a Soviet star on a Red field and Navy print instead of vice-versa. This bag SCREAMS "Soviet Bloc". Has Cyrillic writing with a flying Communist star. If you feel inside the bag, it sure doesn't seem very water resistant. 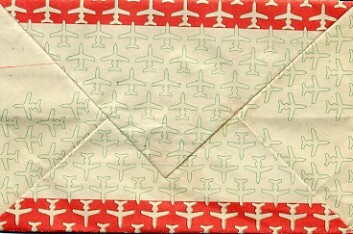 Identical to other bag except the color scheme here is a Soviet star on a Navy field and Red print instead of vice-versa. Get out of the way! 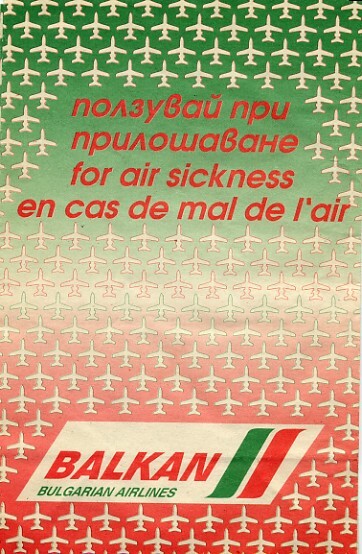 An enormous battalion of Balkan airplanes are flying your way. Better duck when you throw up or they'll get you. 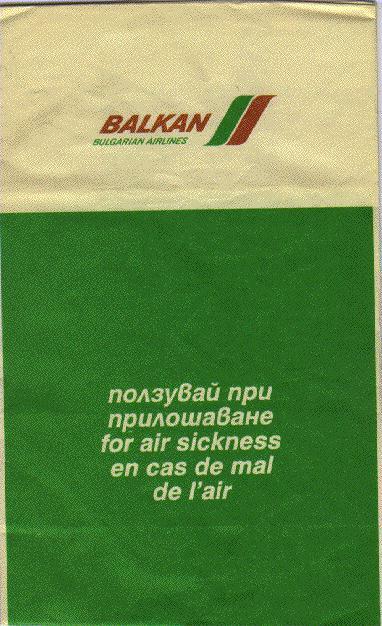 Flimsy bag that could not possibly hold the contents of Bulgarian Weightlifter Claude Bonk's stomach. Unremarkable Bulgarian bag with a little green and red ribbon that makes this bag seem like you're having a party when you throw up. You aren't though. 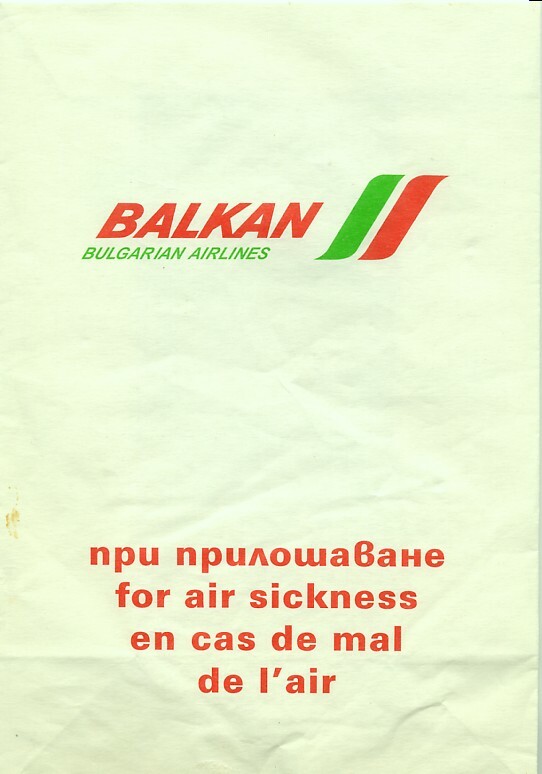 Logo appears above the Balkan name. They changed the logo so they had to print up new bags! 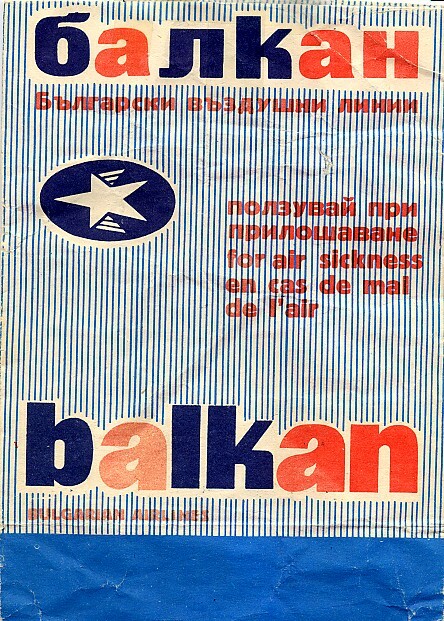 A rather boring Balkan offering sent by the former Yankee 2nd baseman. 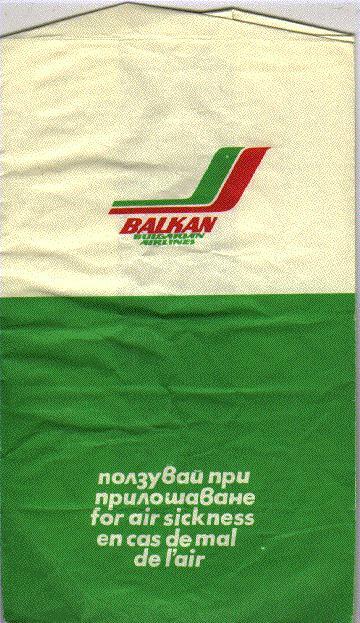 The gusset says the bag is actually printed in Bulgaria by Advertising Agency Maxim Prestige Ltd.
Dull bag that gives you instructions on both sides but the airline name only appears on the reverse side of the bag upside down.